James Hilton’s novel Lost Horizon described Shangri-La as a mystical, harmonious valley. The name became synonymous with any earthly paradise; a permanent happy land, isolated from the outside world. After seven days of searing temperatures and rising humidity levels touring the Far North Queensland, I drove into Cairns early one morning and pulled my car into the forecourt of the Shangri-La Hotel, at The Marina, Cairns. I was far too early for my booking, having misjudged morning traffic; however the staff efficiently sorted things out and, before I knew it, I was relaxing in a delightful Horizon Club Suite. This beautifully appointed suite offered the ultimate in business class luxury. I was particularly delighted with the large living area that opened via full length and near full width sliding glass doors onto a massive and very private balcony with impeccable views over the gently bobbing vessels in Marlin Marina below and out over Trinity Bay. The cavernous bathroom offered up a huge separate shower and WC stall, as well as a very spacious double vanity, complete with the most comprehensive assortment of amenities I have seen in a long time. Pride of place belonged to the deep soaking bath; raised on a stepped, tiled plinth, it provided views through the glass wall through the lounge area over to the marina. The provision of delightfully scented bath salts had me drooling for a long soak later than evening. As I was early enough for breakfast, I by-passed the Horizon Club Lounge, and headed downstairs to enjoy a sumptuous buffet at North Food & Wine. The place was crowded, not just with hotel guests, but with locals who very obviously knew a good thing when they saw it. Many were using it as a breakfast meeting venue, families were catching up with out of town relatives and the place was generally buzzing. My coffee cup was endless refilled as I lingered at my table pouring over a map of the town, and staff were only too happy to pass on tidbits of information about things to see and do, as only locals can! My car had been valet parked and, in the heat, I decided it would be best to get it out rather than attempt to walk the City. What I love about the valet parking system at the Shangri-La is that you pay a daily rate (a measly AU$15!) and you can access your car as often as you like. When you return to the hotel, you simply drop the keys off with the concierge again – love it!! Having shopped up a storm and boosted the local economy to great extent, I headed off to the hotel swimming pool. This delightful rooftop haven is home to the fitness centre (only crazy people work out in this kind of heat! ), a children’s pool and the larger adult pool. A vast terraced area is shaded from direct sun and would be perfect for cocktail functions or even a wedding reception. The pools themselves are raised a few steps from the terrace, surrounded by wooden decking and furnished with a large assortment of loungers, deck chairs and massive sun umbrellas. The crystal clear water was so refreshing – not to mention the ice cold beer served poolside! Before heading out to a dinner appointment, I partook of the complimentary canapés and drinks in the Horizon Club Lounge, served daily in the late afternoon. I dread 4am alarm calls, and my last day in Cairns was no exception. The gentle prodding of my bedside clock wasn’t doing it for me – thank goodness for the wakeup call I’d requested the night before. A brisk shower got me going just in time to be ready for the porter to take my bags to the lobby. My check out was efficient as my check in – even at this ungodly hour! Not only was my valet-parked car ready and waiting, so was my bill and, to my utter delight, the staff had organised a takeaway breakfast box for me … a fabulous assortment of fresh fruit, muffin, muesli bar, fruit juice and sandwich – what a pleasant and thoughtful gesture! I cannot extol the virtues of the Shangri-La Hotel, The Marine, Cairns enough. With their impeccable service, fabulously central setting, outstanding facilities and efficiently friendly staff, you just can’t go wrong with a booking here. You can stroll across to marina to catch your ride out to the Great Barrier Reef, stroll along the esplanade to the manmade lagoon, or shop to your heart’s content. There’s golf nearby and of course you have all the wonders of the rainforest and reef right on your doorstep! 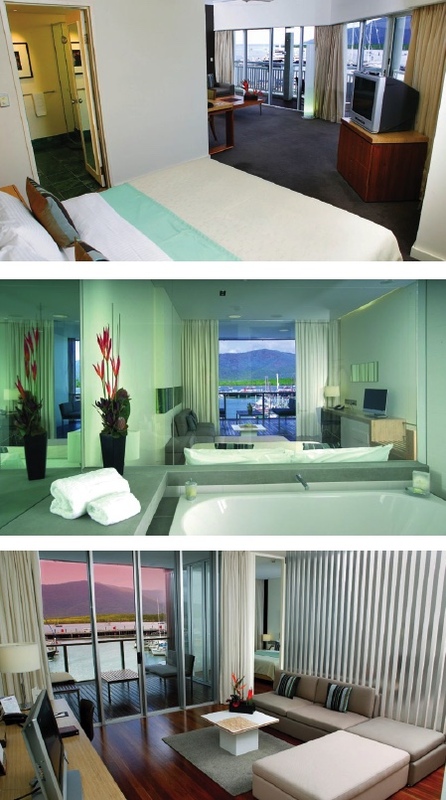 James Hilton was right – the Shangri-La Hotel, The Marina, Cairns was an earthly paradise that provided harmony and, while not isolated from the outside world, it was definitely a haven!